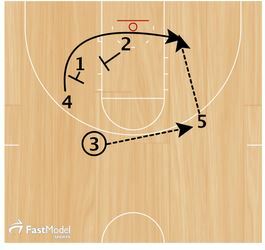 This man to man is from the FastModel Sports Basketball Plays and Drills Library The site has thousands of drills and plays that have been submitted by basketball coaches from around the world. This play was contributed by Adam Spinella Assistant Men’s Basketball Coach at Division III Dickinson College in Carlisle, PA. 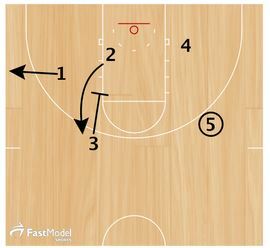 The Atlanta Hawks run this action to get Al Horford or Paul Millsap open for a post-up situation. The Double Rip action usually frees them up to establish very deep position. Teauge (1) passes to Millsap (4) on the elbow, curls over him and sets a screen for Carroll (3) to come get the ball from Millsap (4) in a handoff. Double Rip is set for Millsap (4) as Carroll (3) swings the ball to Horford (5), who steps out. Teague (1) and Korver (2) set the Double Rip. Screen-the-screener occurs as Carroll (3) sets a downscreen for Korver (2) to pop to the top of the key. Teague (1) clears to the corner. 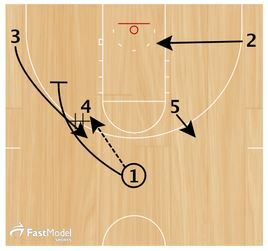 This play is from the FastModel Sports Basketball Plays and Drills Library The site has thousands of drills and plays.